Made from all recycled materials, using whatever you have lying around in your junk model box and craft supplies. 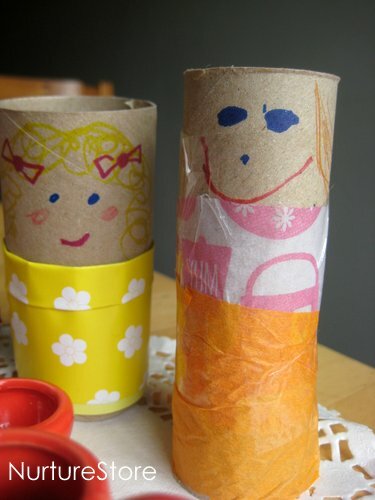 They’re nice to make and really good when you have a group of children of different ages joining in because anyone can make a paper roll puppet – even the youngest of children who can help scribble on a face or some patterns for the clothes. 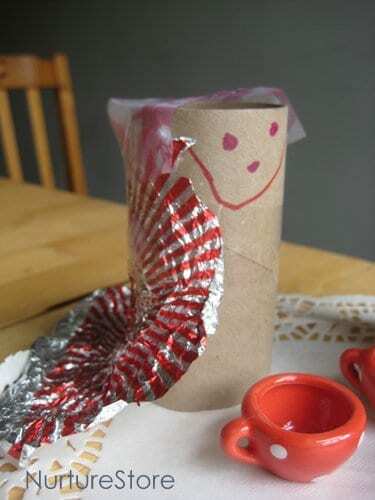 They’re quick to make and produce a result a child can be proud of and play with straight away. 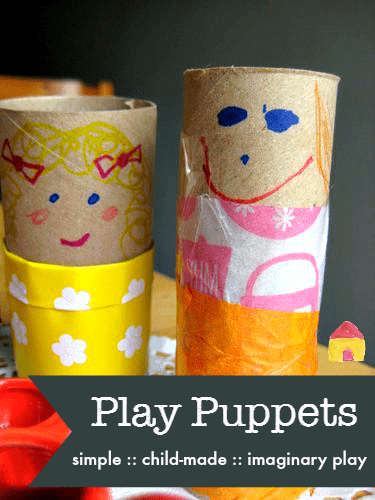 To make your puppets, simply start off with a paper roll. 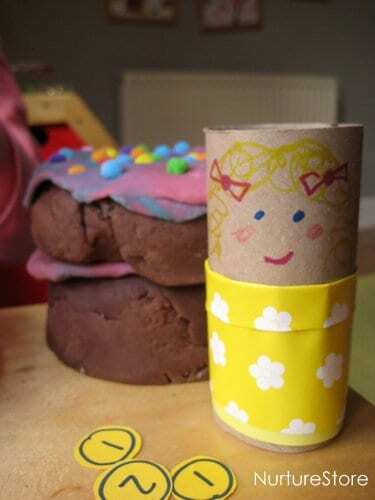 Using sticky tape to stick everything in place means your tea party puppets are ready to play with as soon as you’ve finished decorating – rather than having to wait for glue to dry. And where might these lovely ladies like to play? 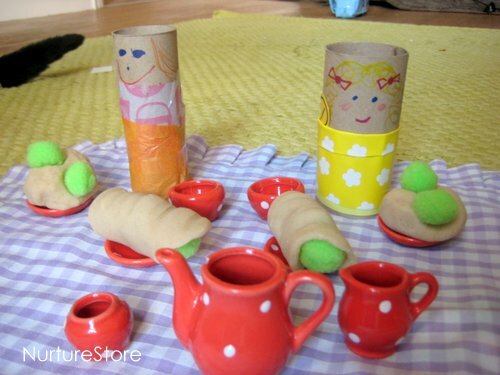 A play dough bakery is the perfect place to buy a cake or two, then its off for a picnic with friends! I set up a small world for Easter that had moss bunnies and chickens, little fake lavender pot plants, wood cookies, small branches, mini pine cones etc on fake grass at the pre school where I worked. I also added nests and Easter books. The children loved playing with it. I also like setting up dinosaur worlds. Cheap shops are a great source of small parts. I would love to set up a tea party. Where did you get the little tea set from? Oh and I love the little sleeping bunnies world – it’s adorable! Hi Charmain. 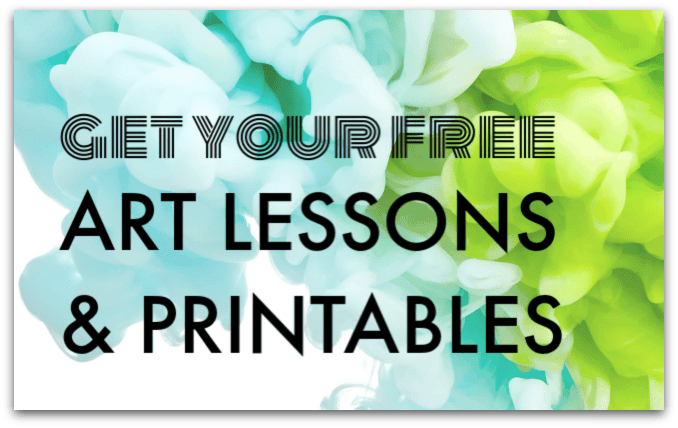 Your Easter small world sounds beautiful and a lovely invitation to spark the children’s imagination. I picked this tea set up in a charity shop a few years ago – another good place for finding bits and bobs!